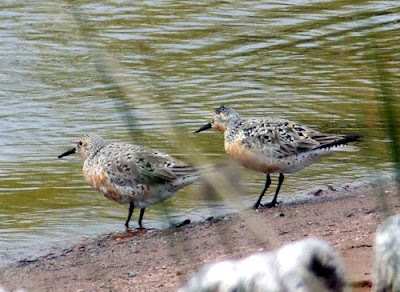 The rufa subspecies of Red Knots are on the fast track to extinction. They migrate over 9,000 miles, from Argentina or Chile at the bottom of South America to the Arctic tundra at the top of North America, and to make that unimaginably long journey, they need a steady supply of food along the way. They make a stopover in Delaware Bay to gorge themselves on horseshoe crab eggs, but horseshoe crab numbers are declining rapidly because we humans are overharvesting them (and, more often than not, just using them as bait). 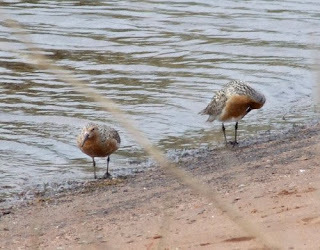 If the knots can't fuel up in Delaware Bay, they can't finish the migration to the breeding grounds to make more knots, or they just starve to death. 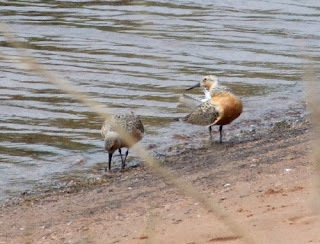 Red Knots were also hunted extensively in North America in the 19th century and in South America today. 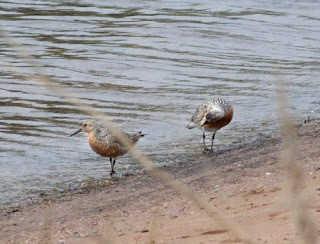 Over the past 20 years, Red Knot populations have dropped from 100,000 to 15,000, and they could be gone completely in another couple years. 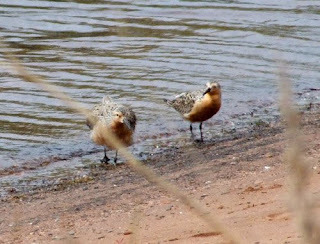 They are mostly coastal birds, but a few usually pass through the Great Lakes region. Two of them stopped by Duluth today and hung out by the soccer fields in Park Point. We had to creep along the sand and crouch in the grass and scrub to be able to watch them, although they didn't seem too disturbed by our presence (and cars/bikes/motorcycles kept going down the street maybe 30 feet behind them); at one point they walked within about 10 feet of us. While hiding in the weeds makes birdwatching easier, it makes bird photography more difficult. Most of my non-blurry pictures are slightly goofy shots of preening or bathing. Or this one, where I miraculously caught one of them mid-blink. 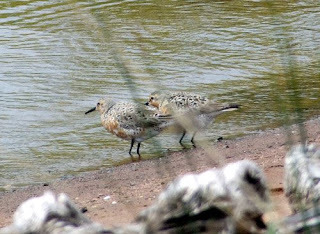 There are people working to save the Red Knots, although it might be too late—they aren't officially listed as an endangered species, so conservation options are somewhat limited. I feel incredibly honored that I got a chance to see them today.